In the 1940's, Charles Boyles took a photo of a South Melbourne Womens team in the 1940's. The photo is in the National Sport Museum Collection. This photo, combined with contact with Academic Rob Hess, has led to the development of this collection of 150+ women's football matches from World War One through to the late 1950's. The Victorian Women's Football League began in 1981. It is the oldest Australian Rules Football League, and the first of many more. Today women play football as they would any other game. This was not always the case and early women footballers broke social norms to play the game. Starting from around the first world war, women started their own footbal clubs and competitions. A number of these competitions lasted multiple years but eventually did not survive. The intention of this collection of matches and photos is to provide a resource demonstrating the extent of Women's football prior to the 1960's and to provide a starting point for others. In the 1920's Newspapers often used the term 'Girls Football' rather than 'Womens Football'. The language does more than differentiate between men and women, and points toward football being more acceptable for younger, unmarried women. Prior to WW1, 'ladies football' was the norm. Newspapers also contain ongoing discussion of whether contact sports were ladylike and whether there was medical evidence to prove that point. The fact that so many women's football games were played to raise money for charity may well be linked to this point, as charity provided, a 'justification' for playing the game. A number of charity games were organised with men versus women, with the men's team often handicaped in some way, one arm, in sacks, etc. The intention of these events was never to play serious fooball, rather they were to have fun and raise money for a particular charity. Matches have varied in their level of seriousness. This is not surprising when the point of many games was not the final score, but rather to raise money for charity. Charity football has been an important contributor to local communities. In rural communities, this contribution should not be under estimated. Other matches organised from the 1920's to the 1940's were by teams representing factories or Women's teams that had been formed. There appears to have been relatively few instances of women's teams representing established men's football clubs in major towns and cities. These matches involving women's teams were numerous and were played across the major cities of Perth, Adelaide and Melbourne. There appears to be a significant under-reporting of women's matches. There are numerous examples where only a 'return match' was reported. It is quite probable that entire seasons of women's matches were also not reported by the newspapers. For example in 1956, a newspaper article on the Footscray club reported that "three of their nine games last season netted £900". I have been unable to locate newspaper records for any such matches. At present, a review of women's matches shows a disproportinate number of games in country towns. It is likely that women played significantly more matches than were reported in the newspapers of Melbourne, Perth and Adelaide. This lack of reporting may lead to a misrepresentation of women's football over this period. Women's football faced a number of obstacles. Evidence suggests that access to grounds was limited. Matches were often on Sundays, evenings, or charity days. There are also a number of examples of requests by women's clubs for ground access either being denied or delayed. Teams to play against were certainly more limited than for other women's sports. The closure of one team probably had a larger impact than in competitions where more teams were available. With limited games and significant practice being required, it is not surprising that women opted for basketball, netball, etc. Netball could also be played at the same time as a football game rather than football that required the same ground be used. Sexist attitudes also caused issues. Men pressured wives not to play, women's teams were banned from grounds, and newspapers were a forum for stigma. Newspapers contained debates whether football was appropriate for a'lady' and that football was too dangerous for fragile young girls, and not appropriate for mothers who had other duties. Players were mocked in newspaper stories with reports mocking the quality of the play. 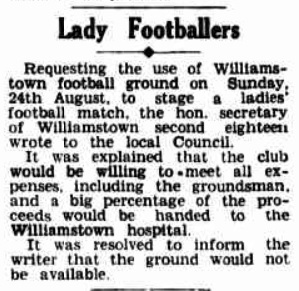 There were some exceptions and where women's clubs were able to establish themselves (Such as Kalgoorlie in the early 1920's), reporting was much fairer. Finally a comment on male umpires dressed as women. It is interesting as to whether this impacted the seriousness of games, or not. At a time when gender roles were more separate, it speaks of an uncomfortableness of the umpire shifting outside his normal role. In most cases where the male umpires dressed as women, the purpose of the games as a fun fundraising event. The earliest Australian Rules Football games involving women were probably unreported social games. An extention of these games were dress up matches played on charity days, played as novelty events. Some of these early charity games invovled men versus women teams. In England in 1894, Nettie Honeyball began a women's football competition.2 This was widely reported in Australian newspapers. Women's soccer would not become popular in England until WW1. During the first half of the 20th century, women's football was dominated by charity matches with various levels of seriousness. The history of women's league football is more problematic. Many attempts were made to create women's leagues, but it was not until the weakening of strict gender roles in the 1970's that the Victorian Women's Football League was formed in 1981.